•	2” Thick, 12” Wide 20 oz. Reversible Vinyl Safety Pad Pad Color is BLUE. Othe colors are available for a small Up-Charge cost. Contact us for a color change. The 9'x17' Texas Competitor rectangular trampoline is perfect for: FUN, or gymnasts and cheerleaders who want to practice at home. Some of the benefits of rebounding include: HAPPY FACES! FAMILY FUN! A STRONGER HEART! increased strength, muscle toning, cardiovascular conditioning, WEIGHT LOSS, and stress relief. Plus, jumping on a trampoline is great fun! The 9’x17’ rectangle trampoline has a structural galvanized steel frame that stands 36” tall. The 6'x14' Permatron mat has 84 sq. ft. of jumping surface. 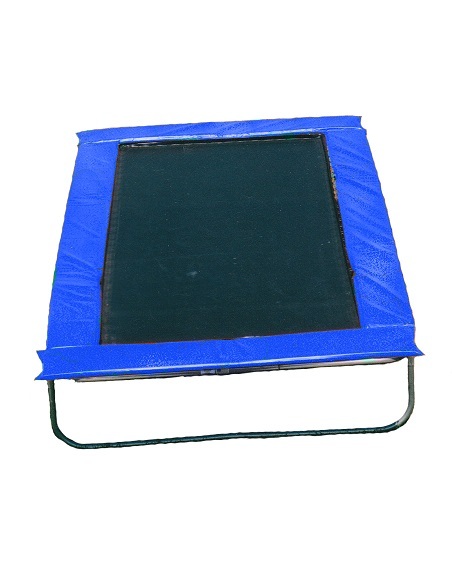 This trampoline features a heavy duty vinyl safety pad that is reversible for twice the life! Our “Ultra Bounce” springs will have you jumping sky high! This trampoline is the safest on the market. It surpasses all ASTM requirements. Safety enclosures are available for this trampoline. Made in the USA. Lifetime Frame Warranty. FREE SHIPPING in the contiguous 48 states. Buy directly from the manufacturer for top notch service!! FREE SHIPPING IN THE CONTIGUOUS USA! *Some shipping charges may apply due to unusual circumstances. *Acts of nature NOT covered by warranty. * Pad Color is BLUE. Othe colors are available for an Up-Charge cost. Contact us for a color change. Copyright © 2008 DE Web Works. All rights reserved.